When my son was little, he loved running his hands over our relief puzzle maps in the museum. 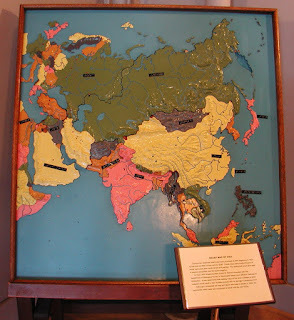 If you went to a residential school for the blind in the United States in the mid-twentieth century, you will remember the large puzzle maps from APH, like this one of Asia. They are large, 41 x 43”, and sit on their own wooden easel. Each country is a piece to the puzzle, sits in a cutout in the base, is painted a contrasting color, and has its mountains and rivers picked out in exaggerated relief. (If you were large enough to run your hands over the actual earth, it wouldn’t feel that bumpy—true story!) Cities are indicated by metal pins. APH Superintendent Benjamin Huntoon began making wooden relief maps in the basement of the Kentucky School for the Blind in the 1870s. By 1921, large hand-carved wooden maps were available with a shellac finish. APH experimented with molded maps as early as the 1930s. This style map appeared in the 1950s and 60s. They were molded from epoxy in an involved process. I guess they fell out of favor when countries started changing borders faster than APH could change the very expensive molds. Think about it, you spend three months carving out a wood casting pattern of Europe, the wall comes down in Germany, and east and west reunite. You spend a month fixing that, and Czechoslovakia breaks up into two countries. What is a wood carver to do?